Notably, for shopping, smartphones or other mobile devices are used almost for any need. With the development of mobile devices and subscription systems, it is possible to develop stronger bonds between the brand and the user. Therefore mobile apps for hotels making difference in tourism and hotel management sectors gets easier. 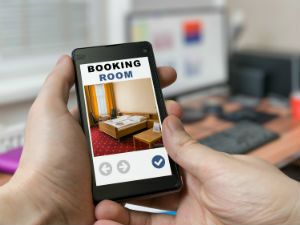 Smartphones and other mobile devices help tourism businesses to offer an awesome accommodation experience to their guests. Potential guests are getting more informed and choosy while making preferences. Apart from geographical and architectural advantages of a hotel, its activity in the mobile world has a great importance. Here are some pluses that tourism and hotel management sectors can gain with mobile apps. Mobile apps are one of the best ways of reaching more audiences in the tourism sector. Especially travelers prefer using these apps for searching hotels and booking rooms. Business managers who want to make use of that potential, better create the mobile integration of their enterprise as soon as possible. If your hotel has a mobile app, you can have a detailed view of the whole process about the management. Therefore, you can detect problems easily and respond it quickly in case it is necessary. For instance; with the analytical data acquired thanks to the app, it may be possible to improve services according to the guest’s previous accommodation habits, needs, and expectations. As a mobile app may have a positive effect on the future preferences of your guests, they also help you to keep in contact with them. For example; mobile loyalty programs can make an opportunity for your brand equity to be memorable in the mobile user’s mind. Then, as sales rate may increase, it is also possible to take important steps to increase customer satisfaction. Mobile apps increase user experience in tourism and hotel management sectors and become a very easy channel depending on era’s conditions. However, if you haven’t stepped into the mobile world yet, you can create your own app via MobiRoller. Create your MobiRoller account and meet with mobile users as soon as possible.